A representative genomic 16S rRNA sequence of strain E9I37-1T was compared using NCBI BLAST under default settings (e.g., considering only the high-scoring segment pairs (HSPs) from the best 250 hits) with the most recent release of the Greengenes database  and the relative frequencies, weighted by BLAST scores, of taxa and keywords (reduced to their stem ) were determined. The four most frequent genera were Nitratiruptor (48.5%), Nitratifractor (20.7%), Hydrogenimonas (15.7%) and Alvinella (15.1%) (eleven hits in total). Regarding the single hit to sequences from members of the species, the average identity within HSPs was 100.0%, whereas the average coverage by HSPs was 95.6%. Among all other species, the one yielding the highest score was Hydrogenimonas thermophila, which corresponded to an identity of 88.5% and an HSP coverage of 67.2%. (Note that the Greengenes database uses the INSDC (= EMBL/NCBI/DDBJ) annotation, which is not an authoritative source for nomenclature or classification.) The highest-scoring environmental sequence was AF420348 ('hydrothermal sediment clone AF420348') , which showed an identity of 96.7% and an HSP coverage of 97.8%. The five most frequent keywords within the labels of environmental samples which yielded hits were 'cave' (7.2%), 'biofilm' (5.7%), 'sulfid' (5.3%), 'spring' (4.8%) and 'structur' (3.1%) (239 hits in total). The five most frequent keywords within the labels of environmental samples which yielded hits of a higher score than the highest scoring species were 'hydrotherm' (8.6%), 'vent' (7.5%), 'pacif' (4.0%), 'microbi' (3.7%) and 'mat' (3.0%) (37 hits in total). 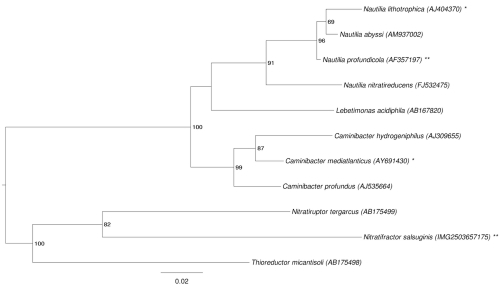 These keywords are in accordance with the origin of the strain N. salsuginis E9I37-1T from a deep-sea hydrothermal vent chimney at the summits of the sulfide mounds in the sediment-hosted back-arc hydrothermal system Iheya North [1,2]. N. salsuginis E9I37-1T, DSM 16511, was grown anaerobically in DSMZ medium 1024 (Nitratiruptor and Nitratifractor medium)  at 37°C. DNA was isolated from 0.5-1 g of cell paste using Jetflex Genomic DNA Purification Kit (GENOMED 600100) following the standard protocol as recommended by the manufacturer. Cell lysis was enhanced by adding 20 µl proteinase K for two hours at 58°C. DNA is available through the DNA Bank Network . 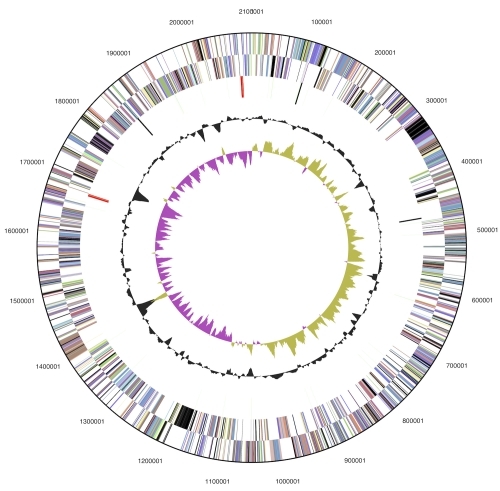 The genome was sequenced using a combination of Illumina and 454 sequencing platforms. All general aspects of library construction and sequencing can be found at the JGI website . Pyrosequencing reads were assembled using the Newbler assembler (Roche). The initial Newbler assembly consisting of 42 contigs in five scaffolds was converted into a phrap  assembly by making fake reads from the consensus, to collect the read pairs in the 454 paired end library. Illumina GAii sequencing data (158.03 Mb) was assembled with Velvet  and the consensus sequences were shredded into 1.5 kb overlapped fake reads and assembled together with the 454 data. The 454 draft assembly was based on 60.3 Mb 454 draft data and all of the 454 paired end data. Newbler parameters are -consed -a 50 -l 350 -g -m -ml 20. The Phred/Phrap/Consed software package  was used for sequence assembly and quality assessment in the subsequent finishing process. After the shotgun stage, reads were assembled with parallel phrap (High Performance Software, LLC). Possible mis-assemblies were corrected with gapResolution , Dupfinisher , or sequencing clones bridging PCR fragments with subcloning. Gaps between contigs were closed by editing in Consed, by PCR and by Bubble PCR primer walks (J.-F. Chang, unpublished). A total of 135 additional reactions were necessary to close gaps and to raise the quality of the finished sequence. Illumina reads were also used to correct potential base errors and increase consensus quality using a software Polisher developed at JGI . The error rate of the completed genome sequence is less than 1 in 100,000. Together, the combination of the Illumina and 454 sequencing platforms provided 106.7 × coverage of the genome. The final assembly contained 274,574 pyrosequence and 2,079,398 Illumina reads. Garrity GM, Bell JA, Lilburn T. Class V. Epsilonproteobacteria class. nov. In: Bergey’s Manual of Systematic Bacteriology, 2nd edn, vol. 2 (The Proteobacteria), part C (The Alpha-, Beta-, Delta-, and Epsilonproteobacteria), p. 1145. Edited by D. J. Brenner, N. R. Krieg, J. T. Staley & G. M. Garrity. New York: Springer. 2005.